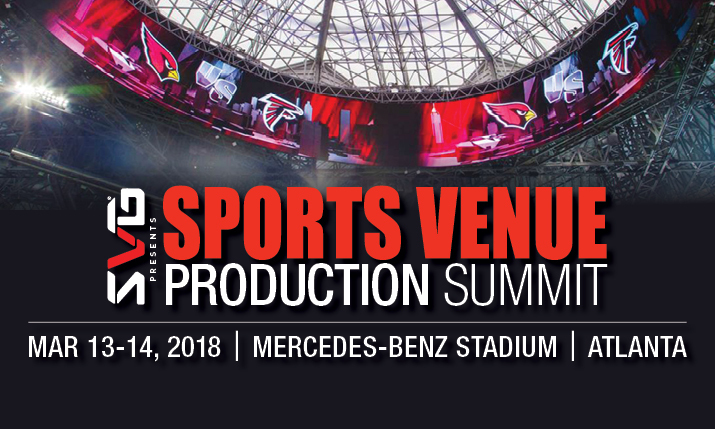 SVG has announced the full program for the 2018 Sports Venue Production Summit, which will take place March 13-14 at Mercedes-Benz Stadium in Atlanta. In addition, the call for speakers for this year’s event is now open to professionals from sports venues, teams, leagues, universities, and broadcasters. This year’s Sports Venue Production Summit will begin on Tuesday March 13, with a behind-the-scenes tour of Mercedes-Benz Stadium, followed by an Opening Night Reception overlooking the field. On Wednesday March 14, attendees are invited back to the stadium for a full day of in-depth panel discussions and presentations focused on engaging fans everywhere. Mercedes-Benz Stadium opened prior to the 2017 NFL season with one of the most eye-catching videoboards in all of sports. Now, with one season in the books, executives of AMB Sports and Entertainment, the video-production team that supports both the Atlanta Falcons and Atlanta FC, share what they’ve learned and how they plan to further enhance the fan experience in Year 2 and beyond. Over the past few years, IP-based technology has steadily grown more popular for video-production workflows and, with the recent publication of the SMPTE 2110 ST standard, is expected to explode in the near future. What does this mean for your game-day production? Will IP technologies streamline your workflows, enable you to produce your show more efficiently, and make your fan experience better? Industry leaders share what they’ve learned in the field and answer your most pressing questions. An unlikely playoff appearance. A long-awaited world championship. A 10-year anniversary of a famous play. A favorite player’s number retired. When it comes to storylines in sports, the possibilities and opportunities are endless. But how do you catalyze your fan base around key moments and keep the momentum going all season long? Hear how teams have treated their franchises’ biggest moments through the use of social media, digital platforms, in-venue presentations, and much more and the tools they’re using to make it possible. As sports venues push the boundaries of video-display design, manufacturers and systems integrators must figure out how to turn concept into reality. What considerations must be made with regards to display format, pixel density, location, and production tools like cameras, lenses, and switchers to make the most of non-traditional displays? Leaders involved in building some of the industry’s most exciting displays and the production systems to support them discuss the process of creating — and powering — a board that’s truly one of a kind. Videoboards — both traditional and non-traditional — would be nothing without captivating video content tailored to fit the canvas. Game-day–production personnel and graphics operators charged with programming in-venue video displays share their approach to creating a dynamic video presentation on a wide variety of shapes that are rarely, if ever, 16:9 and discuss the graphics gear, video processors, and replay servers they rely on to make it happen. As sports venues invest in video-display technology and the top tools to capture content, so too must they invest in the infrastructure to get video signals from Point A to Point B and beyond. Hear from the technology vendors who are leading the charge in signal distribution, both within the stadium and from the truck dock out to the broadcast center. Increasingly, the in-venue control room must serve the video needs of far more than the in-venue displays. Whether it’s a college that becomes responsible for an ESPN3 production, a videoboard producer that must broadcast a preseason game for linear TV, or a videoboard operator that must drive digital platforms, both the capabilities of control rooms and the skills of those working in them continue to evolve. Industry leaders on the control-room front lines discuss the technology that’s making it happen and the comms required to keep everyone in the loop. Bring your fresh ideas and unique perspectives on key trends and technologies driving the future of sports-venue production and technology. To submit a speaker for consideration at the 2018 Sports Venue Production Summit, email Program Director Karen Hogan Ketchum at [email protected] with the speaker’s name, organization, title, and the specific session being requested, along with a brief summary of why the individual is qualified to speak on the topic. Please note that this call for speakers applies solely to end users and does not include technology vendors at this time.